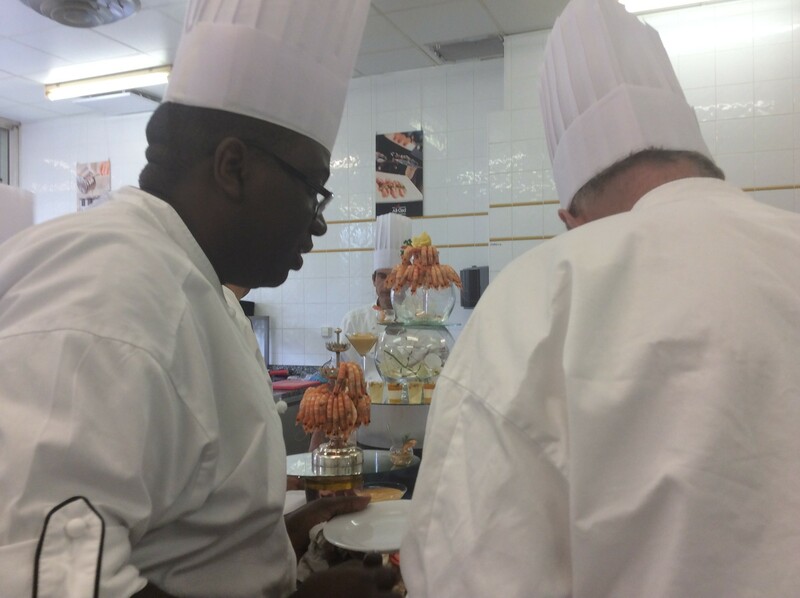 Chef David assembling a franboise religeuse. We thought the pink little topknots (with real gold leaf on the forehead, a la halo) looked like Barbie Doll pink. Really, the German came up with that one. 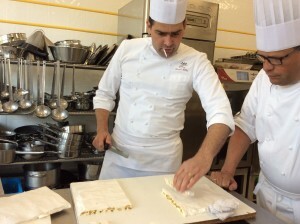 Chef David with the nougat He quit smoking 8 years ago, but still chews on swizzle sticks. What a beautiful last week. It was pastry week, with Chef David, head pastry chef for 12 years in a 3 star Michelin restaurant near Bresse, north of Lyon. (Remember? That’s where the best chickens in the world are raised.) 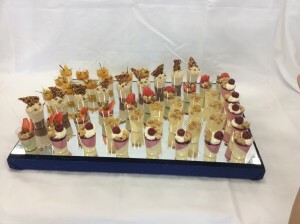 We’d all been foundering with the staggering quantities of foie gras and truffles, but I’m here to tell you that a surfeit of sugar tasting is (a) a fun change, (b) strange. I was chef (head of the team) for the day we made the framboise religeuse. Here we are, David is the tall one. I’m taller than Hiromi. You start craving salty things and protein and telling everybody NOT to make a plate for you of the framboise religeuses (“raspberry nuns”) or the tartes aux cinq chocolates. I was the chef in charge of a team of five making the lovely, creamy, raspberryish framboise religeuses, and the thought of eating a whole one after testing bits of the six component parts of that dessert all day was oppressive. Erica brought plates of salty crackers and Guiness beer cheese to cut the sugar the last two days. 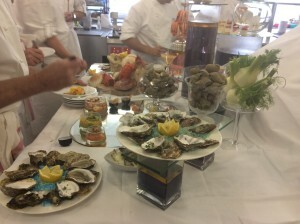 We were actually hungry for lunch for the first time since we got to L’Institut Paul Bocuse. Protein is a great thing. But sugar is incredibly fun to work with. Here are typical cuisine ingredient (also, fish, rabbits, beef, veal, crustacians. The oddest thing is that you shift ingredient palates. We’d been grabbing olive oil and salt and pepper, meat, fish and sauté pans with impunity for two weeks. (Parethetically, “pepper” is pronounced “paper” with a French accent. Or here – THIS is cuisine. That would be veal, lamb, beef, risotto with seafood and other various and assorted trifles. 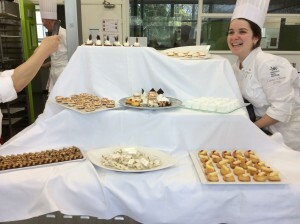 THIS would be pastry, and our darling Elodie, who some started calling our “baby chef.” How misleading! She can outlook almost everyone with one hand tied behind her back. Anyway, we’d been developing great comfort with all the cuisine ingredients and the ways to cut and cook and slice and carve them. This week we’ve been in vanilla, pectin (did you know there are two kinds? ), flour and fruit land. 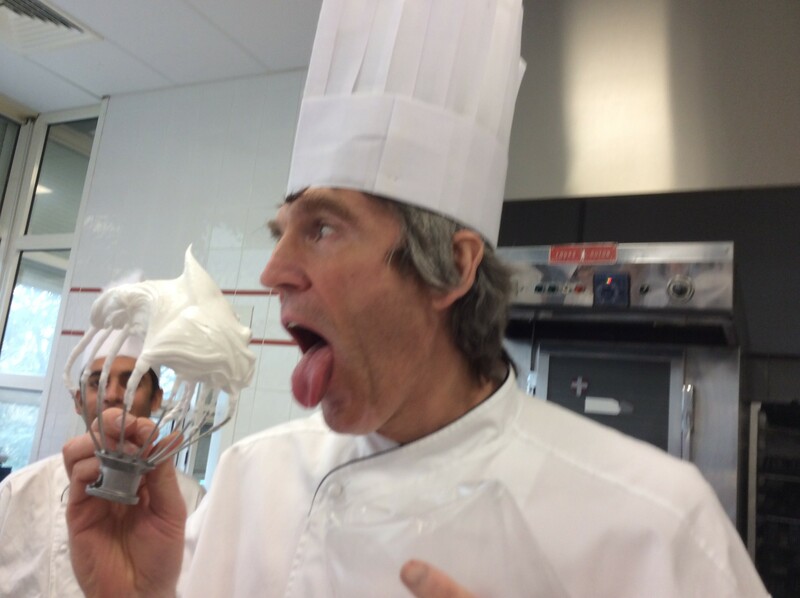 However, I can now report authoritatively that the constant in all French cooking, both cuisine and patisserie, is butter and cream. BUTTER and CREAM. In staggering quantities. 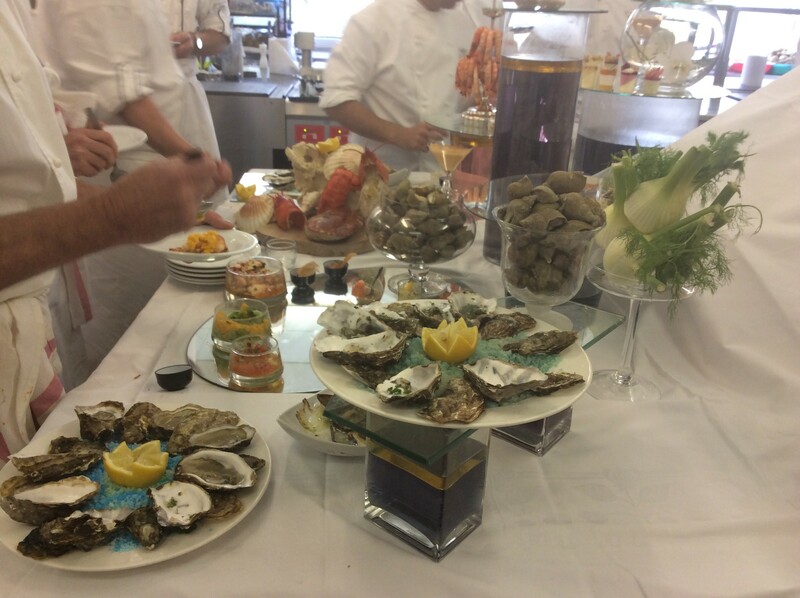 The next door neighbor class invited us to taste shrimp and oysters on Wednesday after I gave them our tray of little glasses of fancy desserts on Tuesday. The other class. On the left is my friend from the Ivory Coast. He SMOKED the final test this week. Hotcha! The other difference with doing pastry work rather than cuisine is that people stand outside our kitchen, elbows propped on window sills, eyeing you like starving children. I started making loads of friends when I noticed the voyeurs. I’d swoop over, scoop up a couple of macarons or little choux pastries, or tiny glasses of mousse-y things and would pass them out the door. Instant delight! I gave my box of a dozen little macarons to the receptionists at the hotel. (Macarons seem to be the most popular sweet thing in France. They’re almond cookies held together with different fillings. 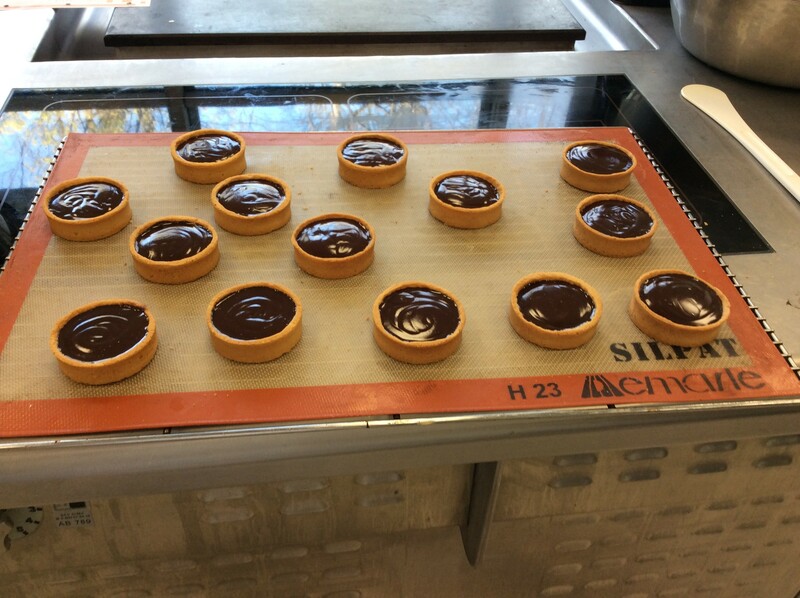 We made some with raspberry jam and chocolate hazelnut ganache on Wednesday.) I came downstairs 20 minutes later to put in a load of laundry and the receptionist was in the breakfast room, covering her mouth with her hand and chewing. She said they were the three best macarons she had ever tasted. Your stock is really high when you can impress is French woman with your cooking. Many try, few succeed. I’m here to tell you, that’s fun. Here was our 6 component death by chocolate tarte with vanilla ice cream. It was really, really good. So it has been a great week. David is a terrific teacher. We did classic creams and pastries and doughs and chocolate things enough times to really get a feel for the themes and variations. 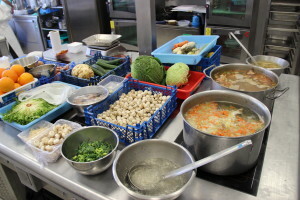 The class was beautifully structured, he had us all divide into teams and mis-en-place the ingredients (put them into little bowls and get everything organized and weighed), then we’d watch the team explain the process and make whatever it was we’d prepared, with David assisting. I can’t imagine him doing a better job of teaching. And oh, did I learn a lot. 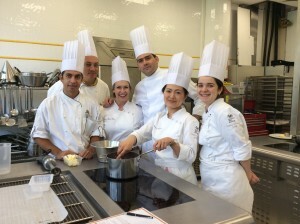 There are huge subtleties with pastry – exact quantities and really precise temperaturesand ways of stirring are paramount. The stuff is fragile. This is three components of a 6 component chocolate dessert (there’s a cookie on the tart, under the dark chocolate mousse. But look t those crusts! My pastry dough is now really good – and I’ve learned the feel of working with it the right way – with the 90 degree angles of very thin pastry. That was worth the price of admission. Raymond from Luxembourg didn’t seem to have the problem with sugar overload. He’s quite the chocolate guy and whipped cream worked for him, too. He kept running 15 kilometers after school, so things do even out. I’m sorry we didn’t do boulangerie – bread and croissant making, which is what I know most about. It’s a completely different discipline in France than cuisine and patisserie, but I got to revisit my favorite baker in Lyon, who toured me through his kitchen last January and gave me his proportions, timings and the secrets of “levain liquid” (starter, but not to the sour degree of sourdough starter – quite a different taste). It had been an incredible three weeks. I’m so grateful that I was able to do this first. It has given me a basis for all the rest of the cooking I’ll be doing. 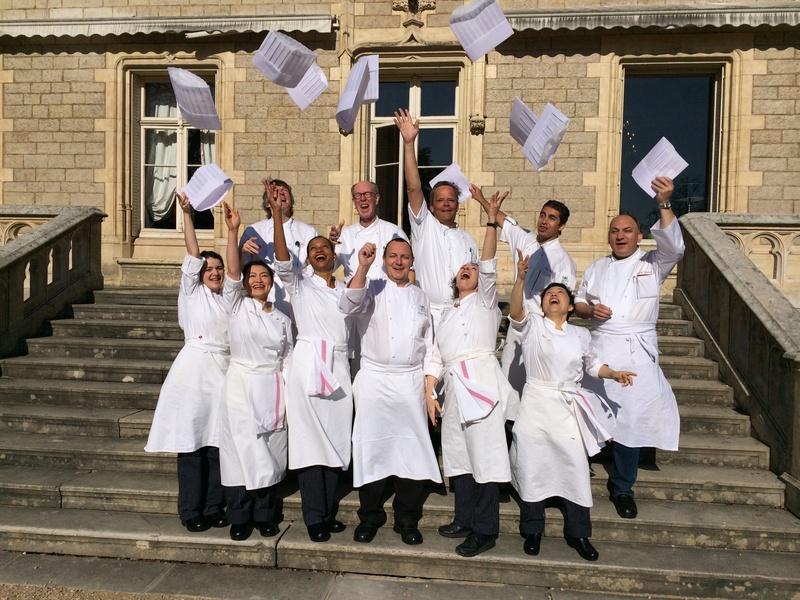 One of the greatest gifts of the time has been the new friends – our class was wonderful. We all spent this last week having that end of camp feeling. We’re done, and we did well. And it was great. 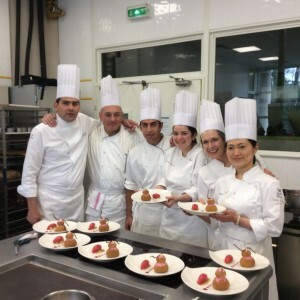 This entry was posted in Cooking, Cooking and tagged cooking schools in France, Cuisine et Passion, Institut Paul Bocuse, Paul Bocuse on March 30, 2014 by Martha Grace Reese. Quick like a bunny, here’s a report from today. Don’t let it detract from yesterday’s post, which is more of a deal in my mind. This is just pastry. Today, we came home from class, I dumped my stuff in my room and went out with Erica to (a) buy some glorious Lyonnaise silk scarves, and (b) to take a thank you gift of some wild rice from the Mille Lacs Tribal grocery store to my favorite boulanger (baker of breads) in Lyon> He showed me what he did lat January, gave me his recipe and proportions and helped me take a quantum leap in baguettes. So, I ended up having about long conversations in French with people in the silk shop (one fascinating couple – he’s a musician and their 2 children each married Americans about food and Lyon. The second conversation was with two older women in the silk shop about the disappearance of the traditional artistry of the silk scarf painters (the ones who make the couturier scarves for Chanel, Dior, Hermes). This store is the local outlet, but their main customers are the Parisian couturiers. (See their website -www.tousoie.com.) But we talked about the disappearance of the amazing artists who do this work, the lack of young people who want to take their places. It was a poignant conversation. But here’s the quick update. 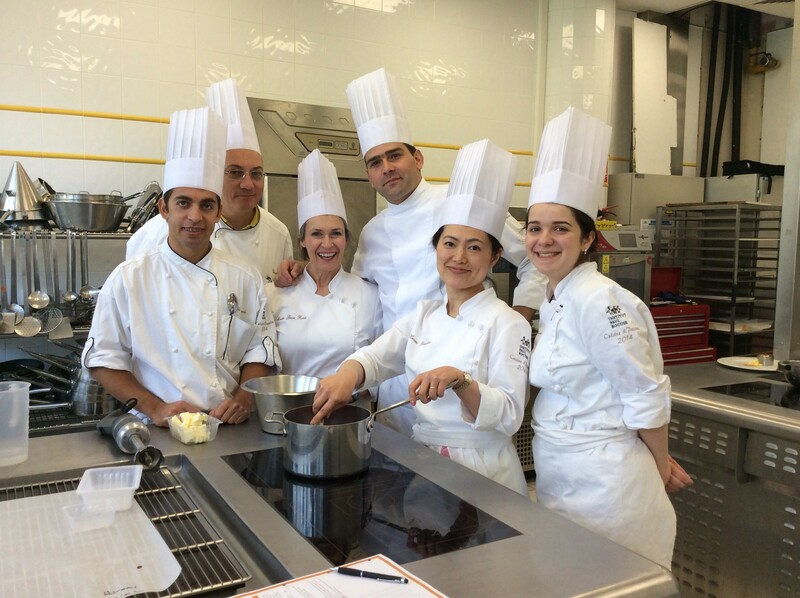 We started pastry classes yesterday and only have 3 more days at the Paul Bocuse Institute. We’re all in grief at the thought of this tremendous experience ending. But just to give you a taste of the greatness, here is what we did the first two days of pastry class. Our teacher is a young guy, fabulous teacher. I’m learning something new every 5 minutes. 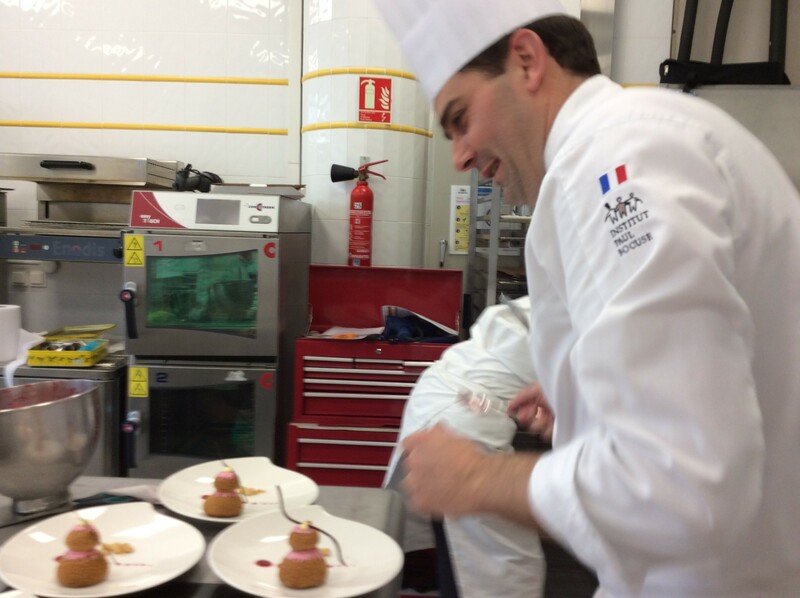 For 14 years, he was the head pastry chef in a 3 star Michelin restaurant near Bresse (where the world’s best chickens come from – see photo 2 posts ago). He had 3 bakers and 5 pastry chefs working for him and now he’s teaching here. For those of you who don’t know, a 3 star Michelin restaurant is the most coveted and rare restaurant designation in the world. I’ve never been to one. Our class will go to Paul Bocuse’s own restaurant (the only 3 star restaurant in Lyon) on Thursday. 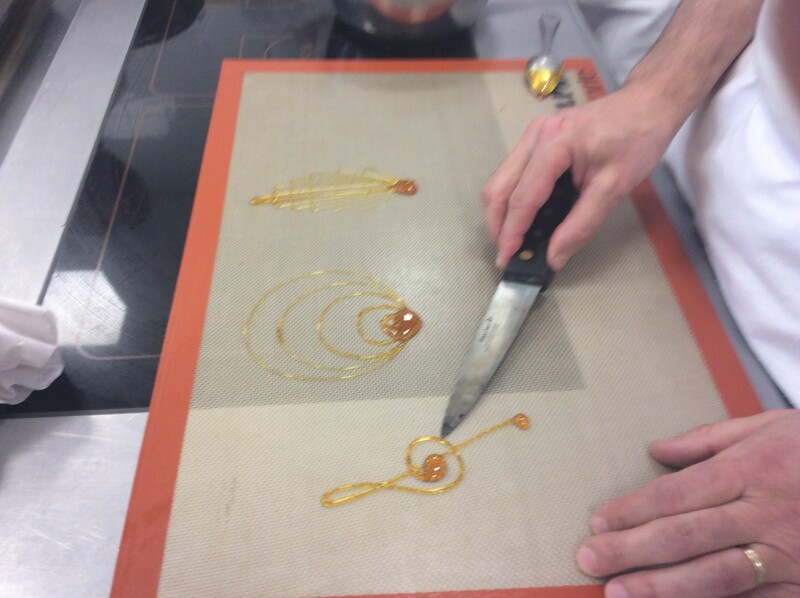 So, in our new pastry class, we are learning great things. 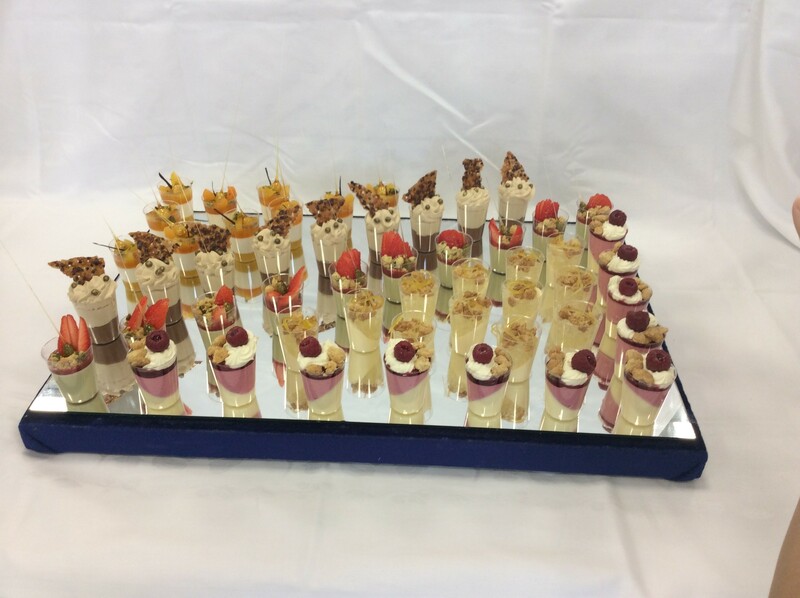 pistachio pannacotta with strawberry glaze, fresh strawberries and pistachio almond crumble (pablo and I did that one – it’s the diagonal line across the middle of the desserts), with carmel-covered pistachio decoration. 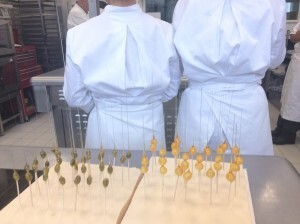 Here are the carmel-dipped pistachio and hazelnut decorations with the long strings on top. Two beloved members of our class agreed to serve as backdrop. apricot something or other (big chunks) with 2 other layers I don’t remember (I haven’t tasted this one yet – I saved it for breakfast). Pablo’s and my pistachio/strawberry crumble concoction is the long diagonal lin i th emissive. Note the pistachio spiky thing in the middle of each one – it’s a 4-5 inch thread of carmel spun around and out of a pistachio. Our demo desserts from the side (these are the ones we gave our neighbor class – there were 40 of each of the 5 sorts of desserts. It was fun! Anyway, they were all fabulous. We gave little presents of the nuts covered with carmel sugar long tapering spikes to our next door neighbor class (the 6 week professional class), when they trooped in to see what we’d at 4 o’clock. 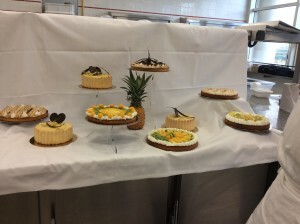 Pablo and I finished first, so I got to do the full presentation of the desserts . We also traded my box of take-home desserts to the bakery chef who promised to give us his recipe for baguettes and croissants tomorrow. Tomorrow is macarons. this is the dessert that EVERYONE tries to do right. I’ve tasted theirs. These guys do it right. I’ll have things to share when I get back. Start working on your Italian meringue, guys. More later. 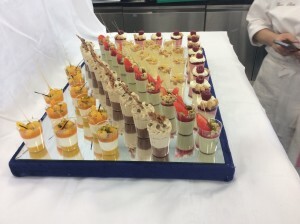 Bonus pcture: Chef David’s quick sugar decorations (a treble clef, a series of concentric circles, and a geometrical interweaving set of cool-looking-things. They’d go on top of a dessert and stand up. They also taste exquisite. 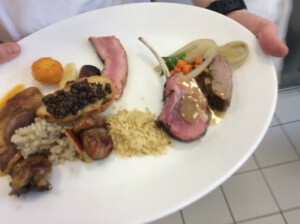 This entry was posted in Cooking, Cooking and tagged Cooking courses for amateurs, cooking schools in France, Cuisine et Passion, Institut Paul Bocuse on March 25, 2014 by Martha Grace Reese.